The presence of ‘wild boar’ in the Forest of Dean and other UK habitats causes highly polarised, conflicting and emotive opinions and attitudes. Feral pigs are seen by some as a tourist attraction that helps forest ecology. However, there are growing local concerns over the havoc they can wreak and, for the wider pig industry, even greater fears about their potential to harbour and spread devastating pig diseases. HOW DID FERAL PIGS BECOME ESTABLISHED? Up to one million wild boar (Sus scrofa ) once roamed our forests. However, this original population was gradually hunted to extinction and the last truly UK wild boar population disappeared around 700 years ago. During the 1980s, a number of farms diversified into wild boar production and opened the flood gates for re-population as animals escaped into the wild, through storm-damaged fences and illegal ‘liberations’. By 1998, viable populations of free-living wild boar were back in the British countryside, including the Forest of Dean, the biggest population, the Kent/Sussex border and Dorset. There are also Scottish populations in Central Perthshire, Dumfriesshire and Lochaber. In 2016/17, 1,562 free-living boar were estimated to be living in the Forest of Dean alone, falling to around 1,200 in 2017/18. But locals believe the numbers to be higher. Defra refers to them as feral pigs/boar, as they are genetically different from continental wild individuals and domestic pigs, with a mixed wild boar/domestic pig ancestry. The resultant inter-breeding has improved breeding success. With no natural enemies and sows producing two litters of six to eight piglets a year, numbers are growing faster than would be the case with pure bred wild boar. WHY DO WILD BOAR POSE A THREAT? The Forestry Commission describes the impacts on residents around the Forest of Dean and visitors as ‘significant’. Surrounding land is being systematically destroyed and public and private bins ransacked, while there are public safety concerns, with attacks reported on walkers and dogs. Some people are afraid to go out at night. More road traffic accidents are now caused by feral boar than deer. However, the pig sector’s main concern is the potential transmission of diseases like African swine fever (ASF) and bovine TB to livestock. ASF has, over the past few years, been spreading relentlessly westwards from Russia, where very few controls exist on the indigenous wild boar population. Much of the spread in the EU has been attributed to either the natural movement of wild boar or, where the virus has jumped large distances, wild boar or domestic pigs consuming contaminated pork products brought in by visitors or workers. This has led to calls from those connected to the UK pig sector for more to be done to keep the Forest of Dean feral boar population under control. Richard Pearson, Pig Veterinary Society vice president, said: “ASF and the expanding feral boar population in the Forest of Dean are of significant concern to the PVS and the pig sector more widely. The virus that causes it is very resilient and can stick around on clothing, hay and in infected fresh pork products for as long as 150 days. Pig vet Fran Baird, from the George Veterinary Group, described ASF as ‘a huge threat to all UK pig producers’, potentially putting in jeopardy our £34 million pork export trade, which equates to over £38 a pig slaughtered. “Only by controlling this population can the risk to the UK industry be reduced and in particular the danger to outdoor pig production. However, in my experience protecting outdoor pig units is very challenging in the presence of wild boar,” he said. While major physical barriers are planned on the Continent, notably in Denmark and Poland, Mr Baird said fox fencing, which is routinely used to protect outdoor herds, is insufficient to defend against wild boar – it would need to be a minimum of 6ft high, electrified and buried around the whole site to keep them out. This is one reason that there are so few outdoor pigs on the continent, he added. Sophie Hope, who farms 380 sows near Gloucester and is only 15 miles away from the centre of the forest, fears that ASF poses ‘a huge threat’ to her business. 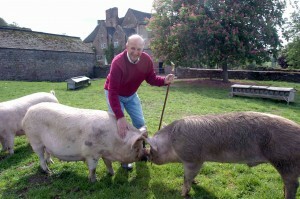 Richard Vaughan (pictured), whose Middle White pig herd is close to where the original releases occurred in Ross-on-Wye, is extremely frustrated that farmers’ concerns are not being taken seriously. His farm holds more than half of the entire UK herd of Middle White pigs, with protected bloodlines – any requirement to cull it for disease control purposes would threaten the survival of the breed. He is unable to allow his herd outside for fear of possible contamination. “The boar coming onto my farm are now so numerous that they are doing a great deal of damage,” he said. He is spending thousands on reseeding and is struggling to keep his land under permanent pasture. Mr Vaughan has approached a number of experts and government bodies but is frustrated at the ‘scandalous’ lack of action. He wants to see more manpower in the form of rangers, to manage the population, with new precautions taken, such as boar- proof bins and public notices. “It’s like harbouring terrorists in our own backyard,” he said. “These wild pigs just trash things and it doesn’t bear thinking about if the disease got onto our farms. While there are inevitably campaigners dedicated to trying to prevent any control of wild boar, Mr Vaughan’s concerns are shared by many locals, who agree the forest cannot accommodate the existing numbers, with a cull of at least 70% favoured by some. The Forestry Commission acknowledges that management of wild boar has ‘long been a vexed and contentious issue’. There is an annual cull – the commission employs wildlife rangers to do this on public land, while on private land culling is the responsibility of landowners. Since 2012, a target population target of 400 has been set. The Forestry Commission website shows, however, that estimated numbers more than trebled between 2013 and 2017, reaching nearly 1,600 last year. However, more than 1,000 feral boar have been culled in the past two years and the estimated population dropped for the first time in 2017/18. The commission acknowledges that its short-term aim is simply to stabilise numbers, before getting the population down towards its target. But it is short on resources and the number of rangers has been cut from six to two this year. The NPA and the Deer Initiative have been consulting with the local MP, Mark Harper and the Forestry Commission. NPA chief executive Zoe Davies said more needed to be done, with a joint approach from all interested parties. “We need a more concerted, proactive approach to controlling the population, including proper support for culling from Defra, dedicated resource to co- ordinate efforts and a partnership approach with funding from all interested parties, including the NPA, BPA and AHDB,” she said.